Definite article or Indefinite article, each of the articles has different uses in different situations. a university, a union, a useful book, etc. a one-dollar note, a one-man army, etc. an MA, a BA, an LLB, a BSC, etc. A or an - sometimes makes a Proper Noun a Common Noun. Proper nouns generally do not take any articles, but when a proper noun needs to be used as a common noun, you must bring a or an - for it. Sometimes indefinite articles are used to refer the number ‘one’/’each’/’per’. Indefinite articles often precede descriptive adjectives. ‘A’ sometimes comes before determiners, for example, a few, a little, a lot of, a most, etc. but in the case of many, a or an - comes after. I have a few friends coming over. There is a little milk in the jar. ‘The’ is used to indicate a particular person(s) or thing(s) in the case of common nouns. Proper nouns generally do not take an article. I saw the boy stealing. Where is the pen I gave you last year? Sometimes ‘the’ is used to generalize a group/whole class. To particularise a non-count noun ‘the’ is required before it. The water of the Arctic ocean is freezing. Please return the money I lent you last year. ‘The’ is mandatory before a thing which is only one of a kind in the universe. The moon is shining tonight. The earth is moving around the sun. Using ‘the’ with geographical nouns generally depends on the size and plurality of the things those nouns refer to. ‘The’ is generally used everywhere except for some cases. So, it’s better to know those exceptions first. Names of continents: Asia, Europe, Australia, Africa, South America, North America, Antarctica. Names of countries: Australia, Bolivia, England, France, Spain, etc. Names of single mountains: Mount Everest, Mount Solitary, Mount Bindo, Mount Fuji, etc. Names of oceans, gulfs, seas, and rivers: the Pacific, the Atlantic, the Coral Sea, the Timor Sea, the Persian Gulf, the Nile, the Murray River, the Darling River, etc. Names of countries with united states or islands: the United States of America (the USA), the UK, the UAE, the Philippines, etc. Names of mountain ranges: the Himalayas, the Alps, the Andes, etc. Names of a group of Islands: the West Indies, the Andamans, etc. 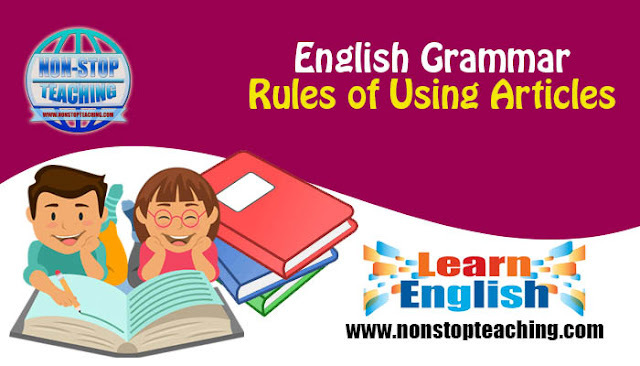 Definite article or Indefinite article, each of the articles has different uses in different situations. Here are the rules of using articles.